The process for organizing any closet is basically the same; so let’s start small scale this week, shall we? 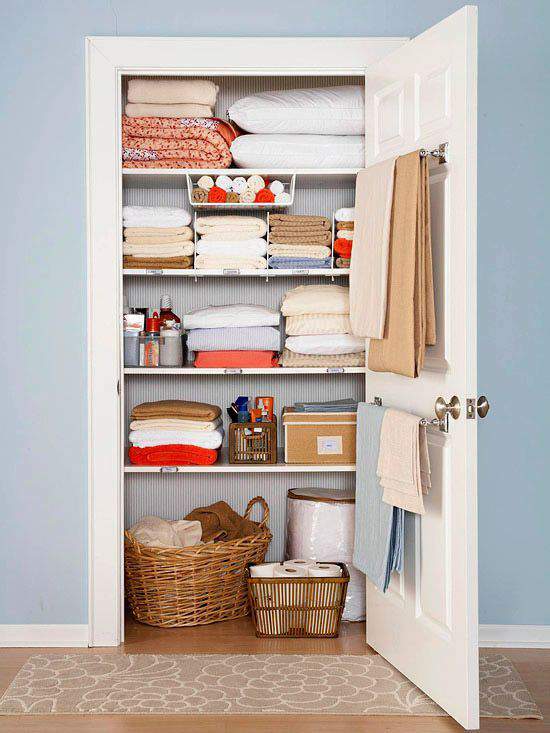 If you don’t have a linen closet, you’ll be organizing the area in your home where you store sheet sets, blankets and towels (perhaps you use a hall closet shelf, a chest, or armoire) . Even though my linen closet is on the small side, it gets the job done. You may remember me giving you a little tour of my linen closet last spring in another closet organization post here. Prepare to start by grabbing your declutter kit and setting up the following sorting bins: Relocate, Donate, Trash, and Keep. If your linen closet is adjacent to a bedroom, bring over all of the contents onto the bed in that room to sort. Otherwise, set up a portable table near the closet to place items on as you empty out the closet. Now’s the time to give the space a thorough cleaning. Wipe down the shelves and vacuum/clean the floor. It feels awesome to have a fresh clean space as a starting point when you begin the organizing process. 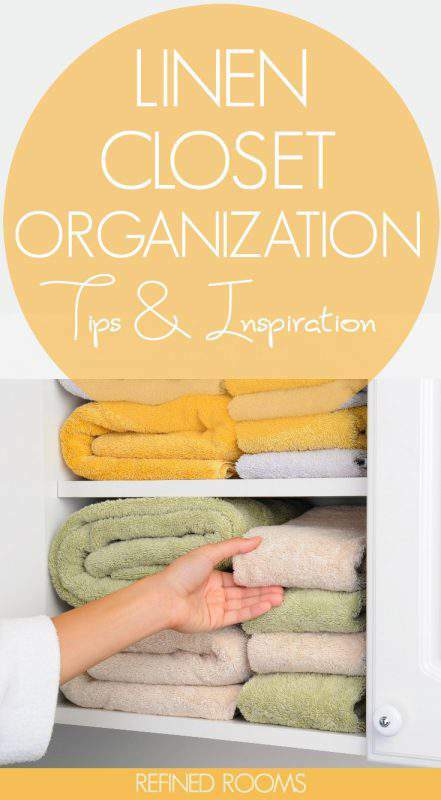 I organized a lot of linen closets during my pro organizers days, and I can tell you that just about everyone accumulates waaayyyyy too many towels and sheet sets over time. I was as guilty as anyone until I did some major purging the last time I organized this space. I had 5 sets of twin sheets in there, and we don’t have a twin bed in our home anymore! How about towels? When yours get old, torn and/or stinky, do you just shove those in the back of the closet and then pile a new set on top of them? If so, you’re normal! But I’m going to challenge you this week to set some limits when it comes to towel and sheet sets. I’ve chosen to keep only 2 sheet sets for each bed (1 set for our guest bed). In addition to our 6 swim meet towels, we currently have 3 towels per person in our household. That’s a limit that I feel comfortable with. It works based on our bathing and laundry routines. Ask yourself what is a reasonable limit for your family before you begin the sort/purge process. With your pre-established limits in mind, set aside your favorite sheets and towels in the KEEP bin, and put the rest in the DONATE bin (your local animal shelters would love to have your towel and sheet donations). Repeat the process for the rest of the items. If you come across items that don’t belong in the closet, place them in the RELOCATE bin. Now that you know what’s going back in and how may items are in each category, take a good look at your space and determine how you’ll “containerize” each category of items, and also how you can maximize storage space in the closet. 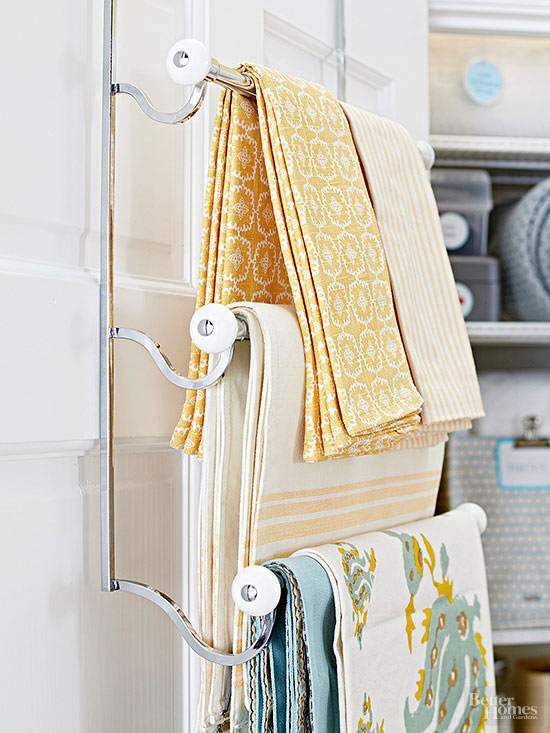 This go around, I plan to use an over-the-door towel holder on the inside of my closet to store table cloths and napkins. This linen closet organization solution is awesome because it not only frees up space on the shelves, it will keep my linens practically wrinkle-free (and boy, do I despise ironing). If I had the space, I’d probably opt to store sheet sets in pretty labeled baskets. Instead, I use Martha Stewart’s method of tucking each sheet set into a pillowcase to create “bedsheet bundles”. If you’re “fitted sheet folding-impaired” like me, be sure to check out Martha’s video on how to neatly fold a fitted sheet. Speaking of folding, using a consistent folding method really does enhance the look of your closet. 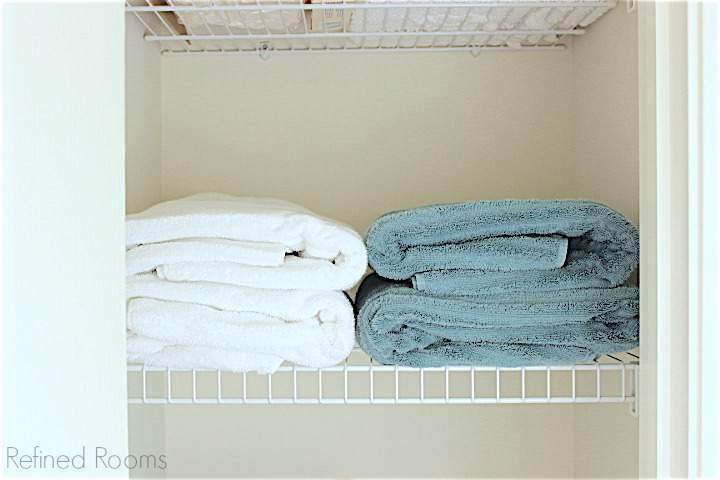 So make sure that you fold each towel the same way, and stack them with the same edge facing outward. Once you’ve completed any containerizing, be sure to label those containers. This step is important if anyone other than you will ever be putting items away in this space. 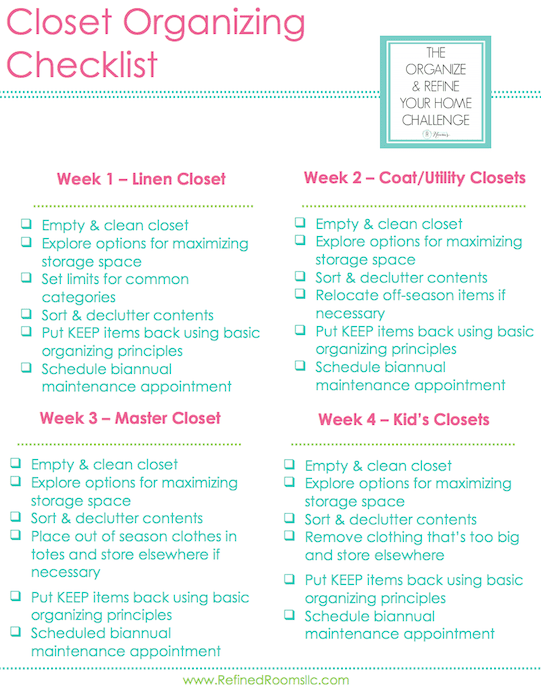 Of course, no challenge assignment would be complete without that last key step in the organizing process…thinking about how you will keep your newly organized linen closet in it’s current state of awesomeness. For most closets, a twice-a-year maintenance session is ideal. I like to schedule these maintenance sessions as part of my spring and fall cleaning routines, but it certainly doesn’t have to take place in the fall and spring. Schedule it when it makes sense for you…but definitely put it in your calendar. After you’ve completed this week’s assignment, share a photo of your newly organized linen closet on Instagram (use the hashtag #OrganizeandRefineChallenge and don’t forget to tag me) and/or share it in the Refined Rooms Facebook community. Let’s get these closets organized! Wonderful post! I agree that setting limits on how many towels and sheets you’ll keep is extremely important. I find the 2 sets of sheets per bed rule works well for my family, and for most of my organizing clients. Thanks for stopping by the blog Nancy! Great linen closet challenge. I recently did this and it has helped immensely. Our closet is so narrow 9 inches deep that I needed to get creative when it came to storing towels and other things in it. I even found narrow laundry baskets to help manage the dirty clothes. Great checklist by the way. Thanks for sharing. Wow Sabrina, that closet would be challenging to work with. Those kinds of spaces often require a bit of out-of-the-box thinking and some trial and error. I’m glad you are enjoying the Challenge!